Today I met Pema Tshering. He was born with cerebral palsy and congenital deformities in his spinal column. As a result both his arms are useless. And he has only limited use of his legs. He is 28 years old. I first met Pema, in Mongar, over four years ago, during an audience granted to him by Her Majesty the Queen Mother Ashi Tshering Pem Wangchuck. He was lively, bright and funny. And he was confident – he eagerly accepted Her Majesty’s offer to train him at the Institute of Zorig Chusum in Thimphu. Pema can’t walk. But he uses his feet, especially his left foot, to do everything. He picked up line drawing very quickly, so I suggested that he learn to paint. I’d thought that he could make a living selling simple artwork and postcards. I was wrong…he was capable of much more than simple craft. 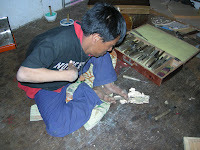 He chose to learn the more physically challenging patra, traditional woodcarving, and is excelling at it. 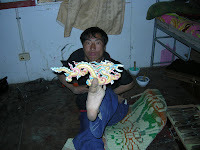 His carvings of dragons, the eight lucky signs and thuenpa pinzhi are as good as any of his classmates. And he has already sold many of his creations. Pema has one more year of training before he graduates as a certified patra carver. After that he plans to open his own workshop. Become self sufficient. And support his grandparents. He says that he has been “fortunate”, and attributes his good luck to Her Majesty. Look out for Pema: artist, entrepreneur, and an inspiration to us, “normal” people.